Last week, Michaela, I was at church and someone told me she had been praying for me, for us, for years. She said that she had prayed I would receive the answers I need. That statement kept coming back to me during the week, like there was something in it for me to figure out, and it finally dawned on me that maybe that prayer hadn't been answered because maybe I don't really want answers. It is, after all, an established fact that every single time it seemed as though I might find out that you were dead, when the lead fell through I did not feel any disappointment that the case did not get solved. I just felt pure relief that it wasn't true. I have to tell you also that there is another feeling I have recognized lately. People have asked me a number of times if I felt guilty over what happened to you, like maybe I shouldn't have let you go to the store that day. And I have always said no, I don't. I honestly don't think I did anything wrong by allowing my daughter, who was almost ten years old, go two blocks to the neighborhood market with a friend. But on a deeper level, I have come to see that I do feel guilty, terribly, horribly guilty and unworthy. I have also said that yes, life goes on, and it should, and I am pretty sure you would have wanted that for me as I would have wanted it for you. Yet deep down inside I feel guilty for every moment of life I have enjoyed since you have been gone. I feel guilty for every minute that I spent doing something else besides looking for you, reaching out to you. I have talked before about how children who have been kidnapped, or even who have run away, are often reluctant to come home because they feel ashamed and unworthy because of what they have had to endure. Well, that is probably no match for the feelings of shame and unworthiness I feel for not having found you, for not having saved you. The human mind and heart are such complex things. So often we have no idea what is really going on in them. So often we have no idea why we do the things we do. One thing seems completely unrelated to another, and yet they are not. Just know, Michaela, wherever you are, that I love you. There has never been a human being on the earth who was more loved, more adored, more wanted, than you were ... than you are. I know that we will see each other again, one way or another, here or there. And in that day, the love we have for each other will be so bright it will forever burn away the shame, the fear, the sorrow, and we will know that we are worthy of that love. God bless you, baby girl. I love you forever. It was so nice to see a blog update and view your supportive facebook friends comments .I sooooooooo wish you the very best. Thxs for sharing your life experiences. When Michaela was kidnapped, clearly more than one life was stolen. You were robbed of the ability to enjoy moments in a state of complete happiness, without feeling guilty that Michaela might be out there waiting to be rescued, without fear that she might somehow misinterpret you being happy as not missing her. Just as you want Michaela to be happy wherever she is, you have to believe she would want the same for you and try your hardest not to hate yourself for it. It is a grueling task and is much easier said than done I'm sure. Life is so precious and we only get so many moments with each other, and we must take advantage of them. Having Michaela in your life taught you just that. It is completely understandable that you might feel guilty for enjoying life when you have no idea what kind of life, if any, Michaela has had over the years. But really, what is the alternative? Reading your blog for so long, I think you understand that it's not realistic to spend your time traveling to other countries, spending every waking hour looking aimlessly for her.... even though emotionally and with your heart that is what you want to do. I hope that if she is out there, Michaela will have the opportunity, strength, and courage to find you. Just like many things in life, all you can do is continue to reach out and keep the door open, and just hope she will grab your hand and walk through that door one day. Thank you for sharing your life and your thoughts with everyone. You are an amazing person. Thank you Sharon for being honest about the guilt you feel. I've read that even parents who have lost children to disease feel guilty. It's clear to me, as on some level it is to you, that you have nothing to feel guilty about, but that doesn't change the way we are - to feel ultimate responsibility for our children, even when what happens to them is beyond our control. Losing a child (God forbid) is the second worst thing imaginable. The worst is, once you've known them, to never have had them at all. I can imagine the joy you feel when you look at photos of Michaela, and I know that despite all the pain, you wouldn't give up a single moment that you had her. And I can imagine that there are moments when the years since the day you last saw her just disappear. There are some things in life we don't get over. We just keep getting through them. My heart goes out to you Sharon. I hope that on some level it gives you strength. Sharon, I know guilt has played a huge part in Michaela's disappearance. I know you feel responsible. I believe this is a normal reaction. As parents, we always feel guilty when something happens to our children. People can try to comfort you and tell you not to feel this way but I know you still do. Try to remember that it is not your fault. It is not anybody's fault but the man who took her. I know you are thinking If Only I.......... You cannot blame yourself. As a good parent you were trying to let Michaela grow by giving her some freedom to do things on her own. All children need this in order to become responsible adults. You let her go to the market out of love and caring. You wanted her to be happy. I bet she was beaming that day getting to go to the store alone with her friend. I am sure she does NOT blame you in any way. I am also sure she knows that you would never stop looking for her or loving her. It was out of your hands. Just like when a child gets a terrible disease. The parent has no control over it and it is the same when a child is kidnapped. You did nothing wrong but to Love your little girl unconditionally. I so understand how and why you feel the way that you do. You had no way of knowing what was going to happen that day. You are not responsible. I have a son who was born with many medical issues. I, too, felt guilty, thinking what I did something to make him sick. What did I eat or drink, etc. In reality, I did nothing wrong. I took care of myself and did all the right things just like you did. Tomorrow my son is having surgery. I am so worried. He has been through so much. I have followed Michaela's story for many, many years. Each time I sign on here I hope to see good news. News that you have found your precious girl. No one can know what you are going through or have been through. I remember I lost my little girl once in a shopping mall. She was only 4. I was holding her hand and she pulled away and got lost in the crowd. I finally found her. She went to see Santa Claus. I thought I would die. I know how frightened I was. I can't even imagine how you feel. Sharon, Check out the picture of Lloyd Lee Welch who is a prime suspect in the Lyon sisters disappearance. He does resemble the composite and also has many acne scars. He was known to travel the country as he was a carnival worker. SHARON ,I know the pain is with you all the time yet I am sorry to hear of your magnified deep yearning, stabbing of the heart sorrow & profound missing of your beloved dear daughter this morning. 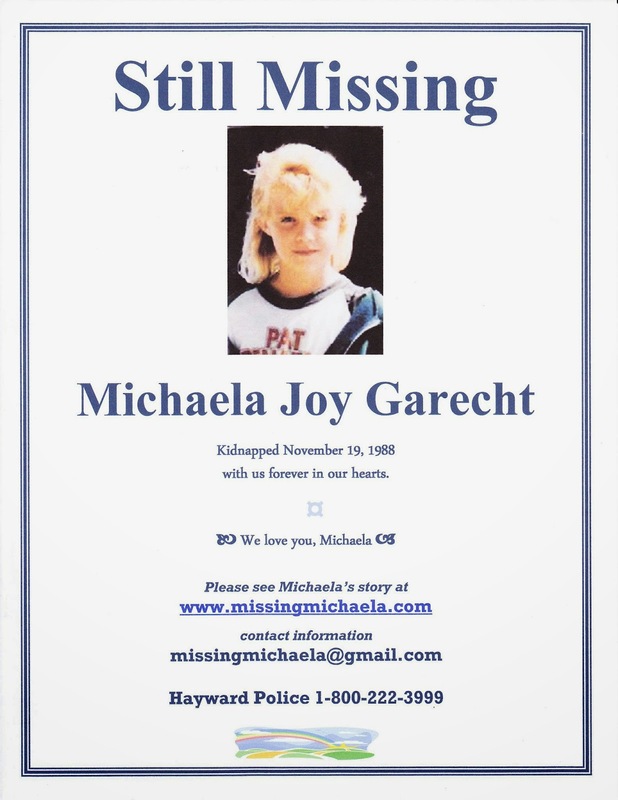 (3/24 blog) I pray you feel better soon..
No one knows how old Michaela's kidnapper was. The only witness was a child. He could have definitely been 32 years of age.